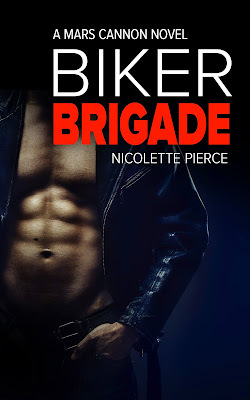 Biker Brigade, the forth installment of the Mars Cannon series, will release this Saturday! If you haven't yet started the series, now is the time. The first book, Deadly Dancing, is free for a limited time. Mars Cannon is in Texas with Brett, ready to face her worst nightmare in court. The Sledgehammer’s trial will commence in only a few days, and Mars’ nerves begin to fray. With Brett’s help, she prepares to face the killer one last time. But there’s a snag. Mysterious boxes appear on doorsteps with new, horrifying evidence. While Annie is behind bars, the murders continue. The defense lawyer will demand her release in light of this new evidence. Mars knows Annie is the killer, so who is the copycat? While Brett works with T to shed light on the latest murder, Brett’s past catches up with him. Mars receives anonymous texts revealing Brett is not the man she thinks he is. He’s a hitman with a perfect completion rating, and his next target hits too close to home. When she overhears his conversation with T, she fears for her life and wants to run. The only problem: She’s stranded in Texas. In a moment of panic, she engages the help of Rand, Brett’s young, ill-tempered uncle. With two serial killers on the loose and Brett on the hunt, Mars quickly finds herself in the crosshairs. Mrs. Janowski and her friends ride in to help, enlisting the aid of the Comets, a biker gang with Mars’ dad as their newest member. They drive cross-country on a mission to take down the lynchpin that entwines them all together. But Brett has other plans for them. Mark your calendar for 10/17 or preorder your copy now!